Order 10 books and get an 11th book for free!!! 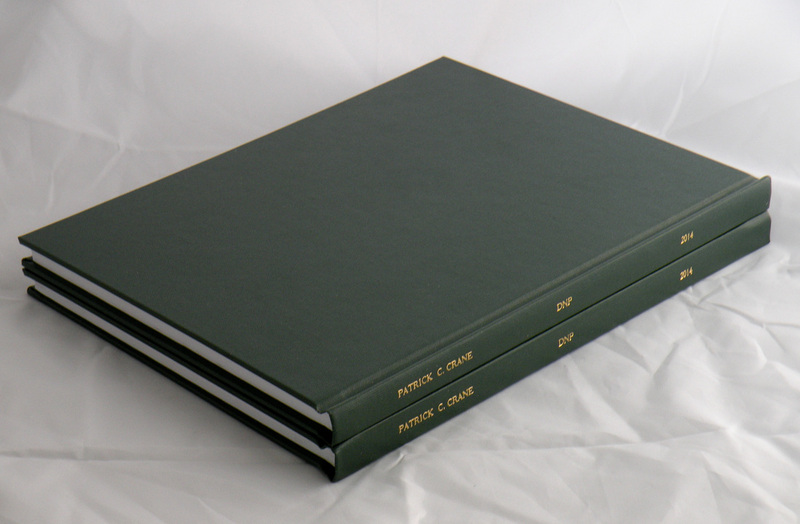 Archival quality, hand sewn, hardcover dissertations bound in library buckram are made to be both durable and elegant. High quality archival materials are used to insure your books will stand the test of time and continue to look great. No automatic machines here, each book is sewn and bound by hand, typesetting and gold titling are done manually to insure precision and accuracy. Additional charges include 6% sales tax applied to the total in Michigan, there is no sales tax for books shipped outside of Michigan. Shipping will be calculated by using the actual cost of USPS Priority Mail plus $5 handling. A Flat $10 fee for typesetting is applied to each job. Books will be delivered to Ann Arbor addresses free of charge. ﻿﻿To place an order Email your contact information and PDF to bohemiobookbindery@gmail.com. Be sure to include your name, mailing address, and how many copies you would like. If you have any color pages please include the page numbers of those which are to be printed in color. We will confirm the order by sending an invoice which can be paid online by credit card. Once we receive your payment we will bind your dissertations and deliver them to you, or send them in the mail, sorry local pick is not an option. The University of Michigan format is our standard. This is a hand-sewn book with a hard-cover in black buckram. The title, author, and year are stamped in gold on the spine as in the photo above to the left. We can add the University of Michigan seal to the cover for an extra $5 per book. We also bind dissertations in the Wayne State University standard format. This is a hand-sewn book with a hard-cover in dark green buckram. The author, degree and year are stamped in gold on the spine as in the photo above to the right. For an extra $5 per book we can stamp the seal of Wayne State University on the front cover. Notre Dame University Standard format is another option. The University seal can be added to the front cover for an extra $5 per book. We can also bind Dissertations for Eastern Michigan University and Western Michigan University, the University seals can be added to the front cover for an extra $5 per book. We can make books to meet nearly any school's requirement. So let us know if you have a special request, or if you would like a different color or format. 25% cotton paper is available at $0.16 per page B & W, $0.60 color. 100% cotton paper at $0.20 per B & W and $0.80 per color. 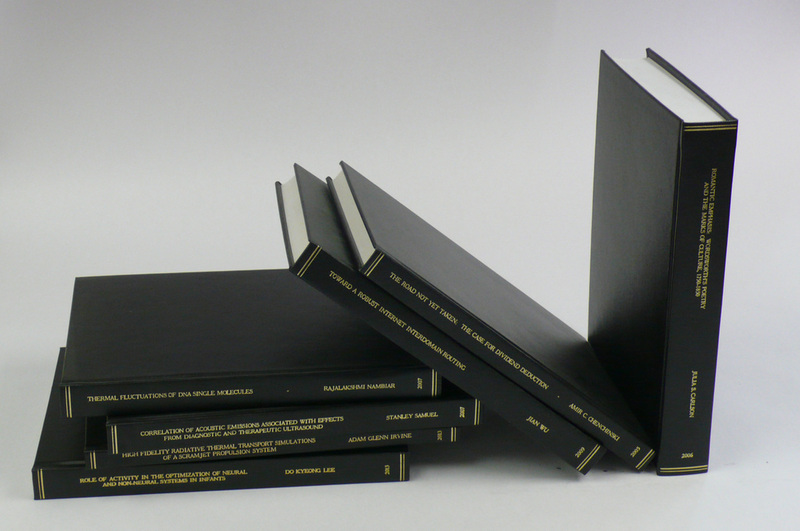 Deluxe leather bound dissertations are available for $125 per book. All dissertations are printed single-sided as it is the standard for most universities. If double-sided is specifically requested we can accommodate, the price is the same.